Pawel Plichta added interests Postmemory and Memory. Pawel Plichta updated their profile information. 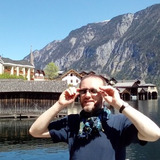 Pawel Plichta changed their profile image. Pawel Plichta added interests Book of Ruth, Book of Esther, Bible and more.